M1 24 Standard bowl shape “C” cup with a 24 throat and Schmidt backbore. Excellent all around mouthpiece for both C and Bb trumpet. M1C 27 NEW – Standard bowl shape “C” cup with tighter 27 throat and Schilke C backbore. A wonderful option for the player that desires a balanced, compact feel with more resistance than the M1 model. M1D 24 Standard bowl cup with 24 throat and TIGHTER Schmidt backbore. Very good option for either Bb or Eb trumpet playing. M1* 24 The “*” models share same rim and cup as the ‘M’ and “MD” models. 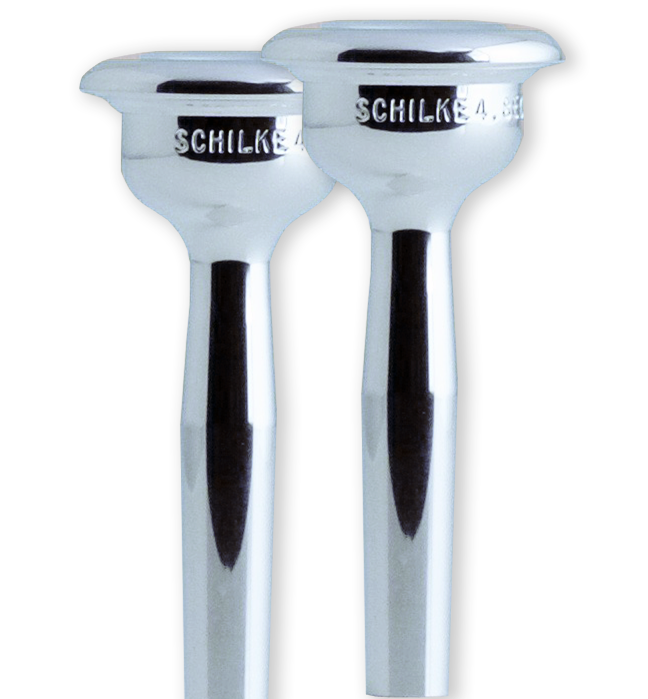 They have a LARGER Schmidt backbore with a shorter throat that creates less resistance and a more open feel. D1 24 Deeper bowl shape cup that still provides feedback for control. The ‘D’ cups have a smaller version of the Schmidt backbore, tighter to balance the deeper cup. F1 20 The ‘F’ models offer a deep “V” shape cup that provides darker, warmer, more conical color allowing one to project at full capacity but maintain a soft mellow sound. These models utilize a shorter shank to compensate for cup volume plus a larger throat size & backbore taper. M150 24 Slightly smaller ‘150’ Rim diameter, standard bowl shape “C” cup, 24 throat and Schmidt backbore. M150C 27 NEW – Slightly smaller ‘150’ Rim diameter, standard bowl shape “C” cup with tighter 27 throat and Schilke C backbore. M150D 24 Slightly smaller ‘150’ Rim diameter, standard bowl shape “C” cup, 24 throat and TIGHTER Schmidt backbore. M150* 24 LARGER Schmidt backbore with a shorter throat in a 150 rim diameter. More open feel. D150 24 Deeper bowl shape cup in ‘150’ rim diameter. F150 20 ‘F’ cup model with shorter shank in ‘150’ diameter. Offers a dark, mellow sound. M2 24 Slightly smaller ‘2’ Rim diameter, standard bowl shape “C” cup, 24 throat and Schmidt backbore. M2C 27 NEW – Slightly smaller ‘2’ Rim diameter, standard bowl shape “C” cup with tighter 27 throat and Schilke C backbore. M2D 24 Slightly smaller ‘2’ Rim diameter, standard bowl shape “C” cup, 24 throat and TIGHTER Schmidt backbore. M2* 24 LARGER Schmidt backbore with a shorter throat in a 2 rim diameter. More open feel. M2X 24 This model has the rim, throat, and backbore of a M2 but the cup shape of the M1 for slightly more cup volume. D2 24 Deeper bowl shape cup in ‘2’ rim diameter. F2 20 ‘F’ cup model with shorter shank in ‘2’ diameter. Offers a dark, mellow sound. M3 24 Slightly smaller ‘3’ Rim diameter, standard bowl shape “C” cup, 24 throat and Schmidt backbore. M3C 27 NEW – lightly smaller ‘3’ Rim diameter, standard bowl shape “C” cup with tighter 27 throat and Schilke C backbore. M3D 24 Slightly smaller ‘3’ Rim diameter, standard bowl shape “C” cup, 24 throat and TIGHTER Schmidt backbore. M3* 24 LARGER Schmidt backbore with a shorter throat in a 3 rim diameter. More open feel. D3 24 Deeper bowl shape cup in ‘3’ rim diameter. F3 20 ‘F’ cup model with shorter shank in ‘3’ diameter. Offers a dark, mellow sound. M4C 27 New from the Schilke custom mouthpiece department, the M4C ‘Symphony Series’ trumpet mouthpiece offers a comfortable rim profile and provides a full, vibrant sound! Created to meet the demands of an aspiring student or professional requiring a smaller inside rim diameter between M3C and M5C models. It futures a standard bowl shape “C” cup with tighter #27 throat and Schilke C backbore. M5C 27 NEW – Slightly smaller ‘5’ Rim diameter, standard bowl shape “C” cup with tighter 27 throat and Schilke C backbore. The new “skeletonized lightweight” profile ‘Z’ trumpet model mouthpieces feature a contour exterior profile which is lighter in mass for faster response. Also featured is a extra tight Z backbore than our standard ‘A’ backbore for slightly more resistance. 6A4Z 15.99 .630 27 CONTOUR PROFILE – A shallow ‘A” cup with cushion #4 rim for extreme high register work with tight ‘Z” backbore. 13A4Z 16.76 .660 27 CONTOUR PROFILE – The shallow “A” cup, semi-flat #4 rim and extra tight “Z” backbore creates an ideal lead mouthpiece with quick response and more resistance than standard model. 14A4Z 17.09 .673 27 CONTOUR PROFILE – Based our most popular 14A4A, offers a shallow “A” cup, semi-flat #4 rim and extra tight “Z” backbore. Created specifically for the lead player, these Symphony Series rim shapes matched with an extra shallow cup and tight backbore on our Symphony Series profile blank provide a very comfortable, balanced mouthpiece with the resistance critical to playing in the extreme upper register with depth and resonance. Ideal for commercial lead trumpet playing. A deep traditional “V” shaped cup along with a larger rim diameter, intended for the player looking for the customary warm, rich cornet sound in the British band style while providing the required resistance and focus when playing fortissimo in the upper register. V1 18 Rim Comparison = Schilke 19/20 or 1C. V150 18 Rim Comparison = Schilke 18 or 1.25C. V2 18 Rim Comparison = Schilke 16C4/17 or 1.5C. V3 18 Rim Comparison = Schilke 15/14 or 3C. Expanding options for piccolo trumpet, these new Symphony Series rim shapes matched with our a shallow ‘A’ cup and Schilke ‘x’ backbore provide a comfortable, responsive mouthpiece choice for piccolo trumpet that is balanced through the range of the piccolo with a clear, resonate sound. Available in three rim sizes in cornet or trumpet shank. These contoured alto trombone mouthpieces are designed in two models. The 4.7EC is more specifically designed for oratorio or solo playing and the 4.8EC is a good choice for ensemble playing. Both are offered in a modified contour which offers the player clarity of sound with crisp articulations. 4.7EC 1 Created for Alto Trombone, the 4.7 EC is ideal for oratorio and classic solo alto trombone playing. This mouthpiece enhances the higher overtones for a lighter and brighter concept of tone color. Similar to our 47B. 4.8EC 1 Created for Alto Trombone, the 4.8 EC is the ideal “all around” alto mouthpiece. Notes center and slot with a pure clarity to the sound. Also useful as an orchestral mouthpiece when blend with larger bore tenors and bass are of utmost importance. Slightly bigger than a 47B. M5.1 K A Medium Shallow Cup that provides more brilliance, and projection due to additional high overtones in the sound core. D5.1 K A Standard cup shape that provides a deeper bottom to the sound core and excellent articulation clarity. Resistance variables are ideal for a principal player. D5.1* K For a more open feel with additional depth to the sound and greater flexibility, the Standard Cup with tapered throat provides slightly less resistance than the “D” model. M5.2 K A Medium Shallow Cup that provides more brilliance with a larger rim diameter than the 5.1 models. D5.2 K A Standard cup shape that provides a deeper bottom to the sound core. M5.3 K A Medium Shallow Cup that provides more brilliance with a larger rim diameter than the 5.2 models. D5.3 K A Standard cup shape that provides a deeper bottom to the sound core. M6.0 O This deep cup is similar to a standard 59 model yet maintains the rim diameter of a 60. It includes a large Schmidt backbore and more open “O” throat. It is an efficient, even playing mouthpiece that provides brilliance for maximum projection when desired. D6.0 O Slightly more open feel than a standard Schilke 60 while maintaining the same rim diameter. It includes a large Schmidt backbore and more open “O” throat. Maintaining efficiency, this extra large bowl provides more depth to the sound core with clarity and consistency at all dynamic levels. Faddis 28 An extra large “Heavyweight” trumpet mouthpiece, this model’s design is based on the mouthpiece used by legendary jazz artist, musician, conductor, composer and educator Jon Faddis for his Schilke S42L Faddis Model set-up. JFXL inner rim equivalent = Schilke 11 with an extra shallow cup. 6E4 15.99 .630 18 Compares to 6A4A rim in diameter. 13E4 16.76 .660 18 Compares to 13A4A rim in diameter. 14E4 17.09 .673 18 Compares to 14A4A rim in diameter. 15E 17.12 .674 18 Compares to 15 rim in diameter. 16E4 17.20 .677 18 Compares to 16C4 rim in diameter. 17E 17.33 .682 18 Compares to 17 rim in diameter. 18E 17.52 .690 18 Compares to 18 rim in diameter. 20E 17.78 .700 18 Compares to 20 rim in diameter. The flugelhorn requires a deeper cup and larger throat than a trumpet or cornet mouthpiece. The Flugelhorn Series feature a deep V-shaped cup, large throat and backbore with a American shank for a soft, dark tone in the following sizes: 6F4, 13F4, 14F4, 15F, 16F4, 17, 18F and 20F. 6F4 15.99 .630 24 Compares to 6A4A rim in diameter. 13F4 16.76 .660 24 Compares to 13A4A rim in diameter. 14F4 17.09 .673 24 Compares to 14A4A rim in diameter. 15F 17.12 .674 24 Compares to 15 rim in diameter. 16F4 17.20 .677 24 Compares to 16C4 rim in diameter. 17F 17.33 .682 24 Compares to 17 rim in diameter. 18F 17.52 .690 24 Compares to 18 rim in diameter. 20F 17.78 .700 24 Compares to 20 rim in diameter. SH-II O The “Helleberg SHII” is made along the same lines as the 66,67, and standard Helleberg. It has the same Helleberg-style cup shape with the same inside diameter as the 69C4 (32.76 mm), a slightly tighter throat and standard backbore. SH-IIF O The “Helleberg SH-IIF” has the same rim as the Helleberg SH-II but with a shallower bowl-shaped cup to accommodate the smaller F tuba. The throat is smaller than the SH-II. The backbore is slightly larger, similar to a Schmitt shape that opens up quicker under the throat to reduce resistance. GEIB (5/16) The Geib model has the same inside diameter as the Helleberg SH-II with a modified rim contour. The Geib cup is more bowl-shaped and slightly shallower than the SH-II. The entrance to the throat is tighter yet it shares the same throat size as the SH-II with a standard backbore.